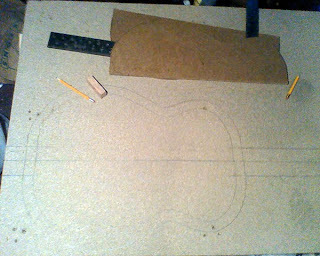 Had to create a new template for the guitar because the Rosewood was 7 3/4" instead of the 8", the original template's width. I also found a smooth pallet that had press-board and figured this would be a much better (smoother) surface for working. 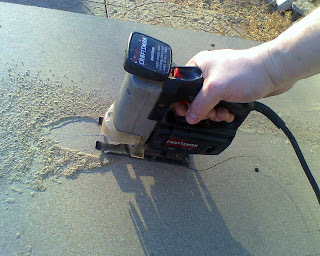 so I glued the other board under this one earlier this week. Drew out the template plus an extra inch all around. And added a tail block for bolting to the workbench. shape is completely cut out. sunny day and warm – no shoes! 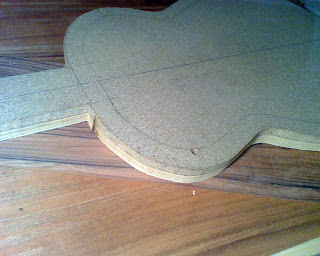 showing the completed board and thickness. 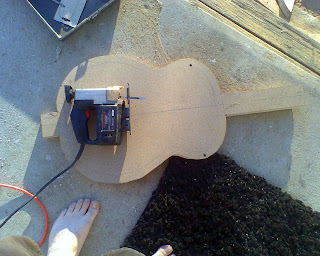 I still have to drill a few holes and make some type of saw-horse to hold the neck end up. The other end will bolt to my workbench. 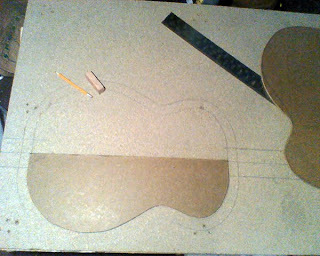 This will allow clearance for clamping and working on the body of the guitar.